6 students from the Welsh Academy of Martial Arts/YMCA Kickboxing Club achieved the highest standard ever in martial arts. These 6 young students were nominated for best achievers during the year 2001 and during their years of martial art practice. During a prestigious Martial Art Award Ceremony held in London on Sunday 28th October, these youngsters were presented with these awards for excellence. They were among over 800 nominees throughout Great Britain and Europe, and only 100 of these martial art experts won. An outstanding achievement also for their instructors. The following students achieved the highest level in the following categories. For Excellence in all areas of martial arts i.e. Respect Discipline - Attitude Compassion - Outstanding Technical Ability Teaching and Dedication. Tristan Dunnett - 1st Degree Black Belt age 10 years who attend Rhws Primary School. Tara Bullock age 13 years Junior Black Belt who attends Bryn Hafren Comprehensive School. Thomas Jones age 10 years Brown Belt who attends Holton Road Primary School. Lauren Allen age 8 years Blue Belt who attends Holton Road Primary School. These 6 youngsters are not only a credit to their instructors, schools and parents, but also to the community, hopefully, educating children within in the community to achieving a standard sought after by many of them. Donna Hillberg told the newspapers that these youngsters deserve these awards for their on going dedication. 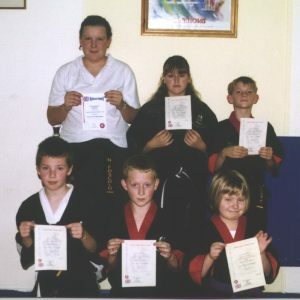 The students told the newspapers that they would not have achieved this level within martial arts if it wasn`t for the guidance and expertise of Lynne Tolcher-James who was also presented with an Award for her Excellence in the contribution and development of martial arts over the years in the Vale of Glamorgan. Lynne who could not attend the ceremony, told the newspapers that she was Delighted with the news and hopes that youngsters in the vale will try to channel their interests into an activity of some kind There is so much that the Vale has to offer. The old saying Oh there`s nothing to do here is so familiar with lots of youngsters today, and yet all they have to do is take the time to go along to their local centres and see what`s on offer.